Resilience is the ability to bounce back from a tough situation. Most of us are pretty resilient. That doesn’t mean we don’t experience stress, sadness, anxiety and a host of other emotions when something bad happens, but over time we adapt. This is particularly important when we’re faced with a situation that will continue for some time, such as caring for a loved one with dementia. Someone is resilient if they show no obvious sign of distress in the face of a significant challenge (such as caregiving); continue to actively engage in life; and see their life as positive, full of meaning, and satisfaction. The good news is that resilience is something that we can learn and foster in ourselves and others. This is one takeaway from a recent article in Aging & Mental Health that examines resilience in individuals caring for a spouse with dementia. The authors interviewed 13 women and 7 men who were caring for a spouse with dementia. They identified eight of these caregivers as resilient although caregivers in general had both resilient and non-resilient characteristics. Similar to research I discussed in my last post, resilient caregivers were able to maintain continuity with their previous life, stayed positive, and frequently relied on humor in their approach to life and their interactions with their loved one. They tended to use the experience of caregiving as an opportunity to learn about dementia and develop new caregiving skills. Having more disposable income was helpful because it contributed to a better quality of life overall, but money alone wasn’t enough to foster resilience. Most important to me, caregivers fostered resilience through their interactions with community and societal resources. This included support from family and friends as well as broader social participation. For example, participation in dementia support groups and the friends made through those connections were particularly important because of the ability to share experiences and expertise with others who understand what they are going through. Resilient caregivers were more likely to recognize their own limitations. When they needed a break, resilient caregivers took advantage of day care, respite care, and home help. In fact, the use of respite care was an important factor distinguishing resilient from non-resilient caregivers. Caregivers who didn’t use respite care said they unaware of the service, did not know how to access it, or did not feel like they were ready to use it. This suggests to me that health and social service professionals who interact with caregivers can do a better job of educating them about the availability of these services, how they can access it, and the importance of using these types of support services early, before they are burned out. Next week I’ll share some useful resources for caregivers and how to find them in your community. 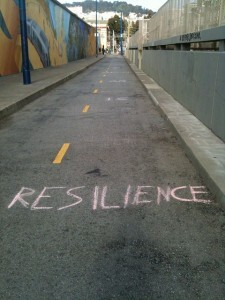 In the meantime, what supports have helped you stay resilient as a caregiver? Subscribe to get this blog sent directly to your email inbox. All caregiving is stressful. After all, you are directly impacting the life of a loved one, often in very personal and intimate ways. About 44 million people worldwide have dementia. By the year 2050 it is expected to be 135 million. Caring for a person with Alzheimer’s Disease or other dementia can be particularly difficult because of the progressive nature of the disease and the effect it has on the individual’s personality and ability to communicate. People with dementia are less able to do basic self care tasks than those with other illnesses, particularly in the later stages of the disease. In addition, caregiving for Alzheimer’s Disease tends to last longer ranging from 4 to 20 years compared to an average of 4.6 years for all conditions. Compared to other patients, people with dementia have on average more days of contact with the health care system, use hospital and skilled nursing facility services more often, have more inpatient days, and see more clinicians per year. People with dementia have an increased risk of adverse drug events because of the number of medications they take and are at greater risk of being prescribed an inappropriate medication. In 2012, one in four people with dementia or multiple chronic illnesses were exposed to at least one high-risk medication. Caregivers are usually responsible for managing these visits, making sure the bills are paid, and keeping track of medication as well as all the other aspects of care. In the U.S., an estimated 15 million families provide care to people with dementia. Dementia caregivers spend more time in caregiving, have more care responsibilities, and report more financial burden and emotional distress than caregivers of older adults without cognitive impairment. According to the Alzheimer’s Association, only 6% of caregivers for a person with Alzheimer’s are spouses. Most are children. This makes sense. Women live longer and are, therefore, more likely to develop Alzheimer’s or other dementia and are also more likely to be widowed leaving a child (usually a daughter) as her primary caregiver. Or if the spouse is still alive, they are likely to need care themselves. While many of the caregiving issues are the same, caring for a spouse versus a parent carries unique challenges because of the nature of the relationship. 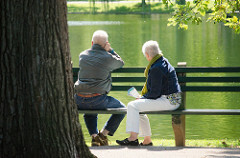 One recent paper by researchers at Lancaster University in England discusses the results from ten qualitative studies published between 2004 and 2013 that examined the impact of dementia on couples’ relationships. They identify several themes across these studies. Couples worked to keep a shared identity as a couple. Dementia was something external to the couple even though one person had the illness. Coping involved teamwork and an ability to adjust to shifting roles and responsibilities as the dementia progressed. Some couples planned the transition while for others it was a more organic process. Shifting roles led to different power dynamics which also influenced each partner’s identity. Some spouses embraced the new responsibilities, others felt them only as a burden. Partners were attuned to how changes impacted the other. The spouse with dementia wanted to protect their partner and avoid burdening them. The caregiver wanted to protect their spouse’s autonomy and sense of self. In both cases, they had to change their expectations as the dementia advanced. Couples were resilient and demonstrated that in a number of ways. For some this meant continuing with their usual activities no matter what. Others reevaluated their life together and developed strategies and adjustments to make the most of their remaining time together. It seems so obvious to say that when one spouse is diagnosed with dementia the couple is affected. Our current approaches to treatment and research, however, don’t always incorporate the couple as a unit. This paper highlights some of the reasons that is so important. More on caregiving and dementia in upcoming posts. In the meantime, have you or someone you know cared for a spouse with dementia? Do these themes resonate with that experience? 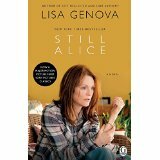 By now I i magine most of you reading this have heard of Still Alice by Lisa Genova, or at least the movie based on it starring Julianne Moore as a linguistic professor who is diagnosed with early-onset Alzheimer’s Disease. I always have my eye open for non-textbook materials for students to read in my Mental Health and Aging class so my read of this book was with that in mind. I have relied on chapters from Mental Disorders in Older Adults (Zarit and Zarit, 2011) and The Alzheimer’s Project from HBO Documentary Films. 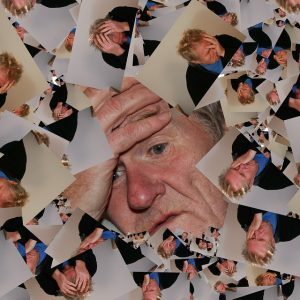 Zarit and Zarit provide excellent clinical material, in particularly useful insights on when memory loss is normal and when it’s a sign of a larger problem. The Alzheimer’s Project includes a series of films about the science behind ongoing research on Alzheimer’s; profiles of individuals with Alzheimer’s, their families, and the many challenge they face; and a variety of supporting materials. Still Alice is definitely a candidate to add to the list next time I teach this class. Why? For one, it’s a quick, easy, and engaging read that would provide a nice complement to Zarit and Zarit. Second, the story focuses on early-onset Alzheimer’s. While less prevalent than later onset of the disease, it is equally devastating to the individual and his/her family and includes some different challenges. 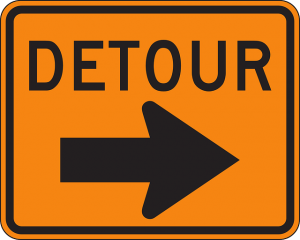 In particular, with onset in the 50s, 40s, or even earlier, it disrupts a different stage of life – mid- or even early- career, perhaps younger children, and a different orientation to the future. Finally, it’s told from the perspective of the person with Alzheimer’s. To me this was one of the most compelling aspects of the book and Lisa Genova has clearly done her research. Watching from the inside as Alice declines, her efforts to cope, and her increasingly infrequent moments of clarity is gut wrenching. In her mind, her husband goes from John to that man in the chair or the man who owns the house, her daughter Anne becomes the Mother, and her daughter Lydia is the actress. Her thoughts repeat and twist back on themselves. Something that seems so important and monumental one moment is forgotten in the next when her attention is captured by something else. It’s this perspective that I think will make it a good addition to a syllabus. As social workers, we always try to start where the person is and empower them to the extent they are able, but it can be difficult to do when the individual has a hard time communicating. Having a window into where someone with Alzheimer’s is, even if that window is a fictionalized one, seems like it would be of great use to social workers and other health care professionals.